Splash into savings with El Paso Electric’s pool pump rebate program! Purchase an ENERGY STAR multi-speed or variable speed drive (VSD) certified pool pump with an integrated controller to use less energy. Conventional pool pumps waste energy by using the same pump speed continuously. Multi-speed and VSD pool pumps operate at multiple speeds depending upon the task of filtration or vacuuming. Receive an El Paso Electric $300 rebate and enjoy a refreshing dip in your energy expenses! Available to residential and commercial customers in El Paso Electric’s New Mexico service area. Commercial applicants should use the residential version of the application form that is available for download at the bottom of this page. El Paso Electric customers are eligible to receive a maximum of one $300 rebate for a new qualifying pool pump. The qualifying pump must be ENERGY STAR certified and be accompanied with an integrated controller. Pools pumps must be purchased within the current program year. Please see the eligibility list at the bottom of this page for the current qualifying multi-speed and VSD pool pump models. Note: The ENERGY STAR website is subject to change at any time. If you do not see a particular unit on the EPE eligibility list, you can also refer to the ENERGY STAR listing of certified pool pumps. 1. Select a contractor of your choice. 2. 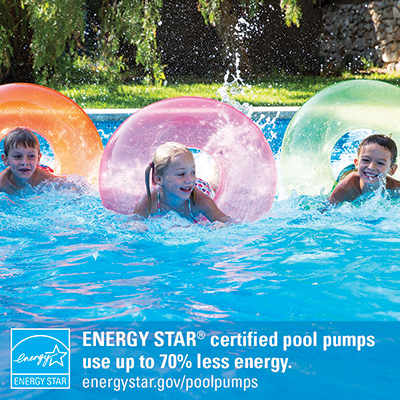 Customers may also elect to pursue an EPESaver ENERGY STAR Pool Pump rebate without the help of a contractor. 3. Purchase a unit that is ENERGY STAR rated. To view the qualifying models, please see the eligibility list at the bottom of this page. 4. Once a new pool pump has been installed, the EPESaver ENERGY STAR Pool Pump rebate form must be completed online or mailed, along with a copy of your receipt or invoice and a photo of the installed pump to the rebate processing center address. The rebate form can be downloaded by clicking the link at the bottom of this page. 5. Your rebate will be mailed directly to you. Rebate checks will be mailed within 4-6 weeks of receiving the application. *Pool Pump must include integrated controller, and rebate will not exceed the total a customer paid for a qualifying model. Select a retailer for your project or schedule an energy assessment. These retailers have participated in EPE’s rebate program in the past and are in good standing. However, EPE does not recommend any particular retailer over another. You may select a retailer from this list or another retail location of your choosing. Save time and fill out your rebate application online. Click “Apply Now” to get started! After registering and confirming your email address, please select the “Customer” option in the profile wizard. You will need digital copies of your invoice or receipt and additional documentation on the work performed. Please mail any rebate applications to the EPE Rebate Processing Center. Make sure to include a copy of your receipt or invoice. Rebates are issued on a first come, first served basis until funding is exhausted or the program is changed. EPE reserves the right to adjust programs at any time. All rebates are subject to approval by the Program Manager. © 2019 El Paso Electric. All rights reserved.